Parents/Guardians may assist their children with the completion of this application in all areas except the essay portion. If selected, you may be asked for documentation to support the data you provide. All correspondence and award agreements will be generated from the personal information submitted below. 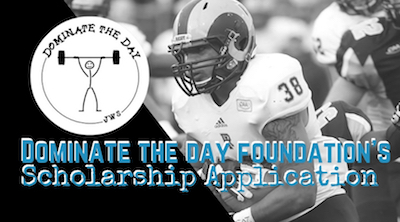 Dominate the Day Foundation is a non-profit organization established in memory of Jordan William Sebastian, an exemplary young man who valued education and athletics. In his honor, we are committed to helping young people become the absolute best version of themselves, through character, relationships, academics, sports and their positive impact on the world. We are offering tutoring scholarships to area high school students at Total Learning Group in Branford, CT www.totallearninggroup.com Each student accepted will receive full or partial scholarships for weekly tutoring services tailored to meet his/her needs. Those needs will be re-evaluated quarterly. Participate in Dominate the Day Workshops designed for and offered to your cohort. Attend quarterly evaluation meetings with Dominate the Day and Total Learning Staff to assess your progress and needs. Volunteer for at least one Dominate the Day event per year. What works best for your family? Select all that apply. Information regarding gender, ethnic origin and race are optional. The information is requested for post-scholarship report generation only and in no way affects your selection for scholarship awards. In which classes do you excel? In which classes do you struggle? What type of help do you need most? Do you have an IEP or 504? If so, what are some of your teaching and learning modifications and/or accommodations? Are you willing to share those documents with Total Learning Group and Dominate the Day? Your essay should be 300-500 words. In your essay you should address your academic goals and needs, describe your personal level of committment to your education, and tell us about any non-academic accomplishments, personal characteristics, obstacles or experiences that make you uniquely deserving of scholarship consideration by Dominate the Day Foundation. You may volunteer as a family or an individual with parental consent. This should be signed by the parent. By signing (typing your legal name) in the space below, you are certifying that all information is accurate and honest. You are also agreeing to the student-expecations outlined above. When you press the submit button, you will receive an email confirmation that your application was received. Please print for your records and retain as verification of your application.